Beautiful Thank you card Rachel - as always! Thank you Leslie. 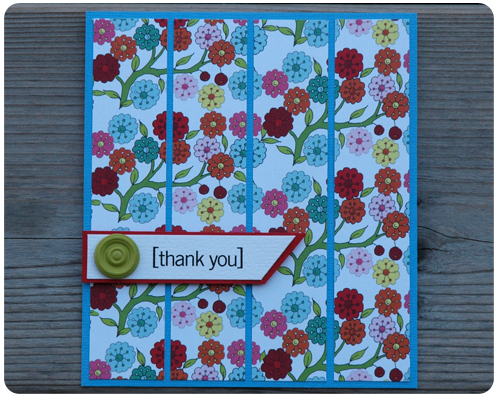 And thank you for stopping by each week to see my cards. Thank you so much for visiting my blog. I always love finding new blogs to check out and follow. This card is so pretty with the strips of paper and angled banner. Thank you Lisa for your lovely comment and for following along. What a beautiful card! I think the addition of the green button is my favorite part. I've never thought to do that! It gives it such a fun feel, and really adds to it. Thanks for the inspiration! Thank you so much Michelle. This was a really fun card to make. I like how you toned down the busy paper. Those are some very talented daughters! Thanks Lanaya. It is always a bit of a challenge when working with busy paper, but I am very happy with how this card turned out. I love the flowered paper, it is so pretty. Beautiful card! I love the pretty floral pattern. 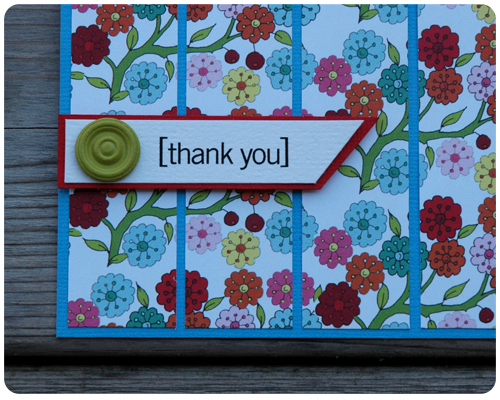 Thank you so much for sharing at A Bouquet of Talent this week! Happy Friday!! Thank you for stopping by and for your lovely comment Kathy. I had a lot of fun making this card.